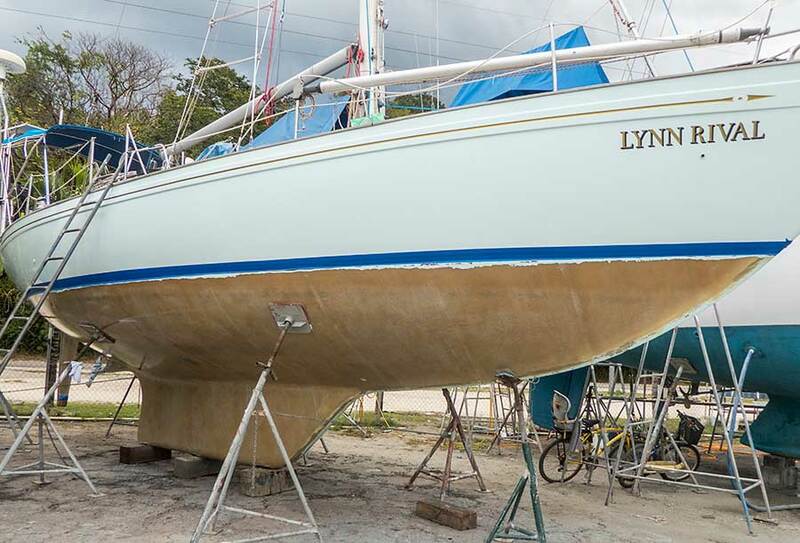 When we hauled Lynn Rival out of the water in October we realised there was a problem with the hull below the waterline. We engaged a local contractor (who is nicknamed "Cow", being vegetarian) to strip down to the gelcoat, hoping that we'd be able to start again from there. When the gelcoat was exposed we were reminded of how badly it had been damaged from being slurry-blasted in 2012: it was full of pinholes and contamination, in some areas down to the glass fibre. Cow didn't hold back in his description of the mess we were in. 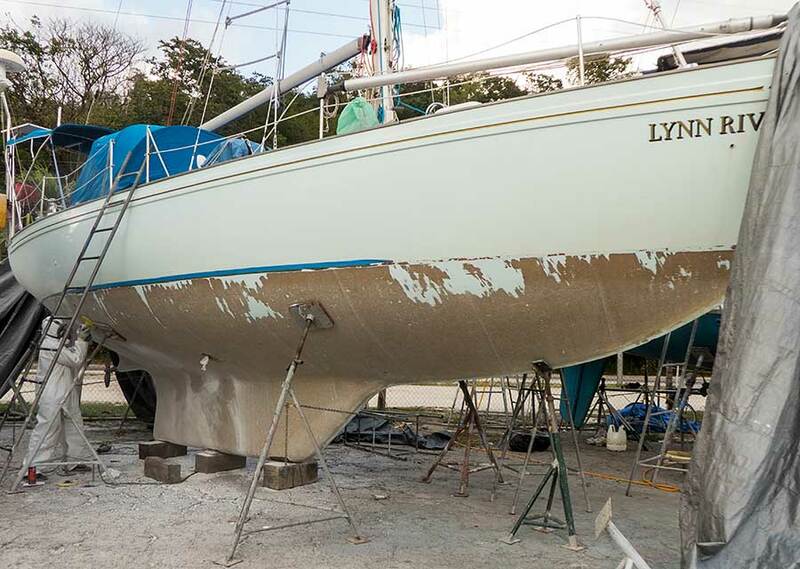 To be sure of eliminating the problem that had caused the blistering, we would need to have the hull stripped further. It was very sad to see all the remaining gelcoat being taken off. First coat of epoxy resin . . . 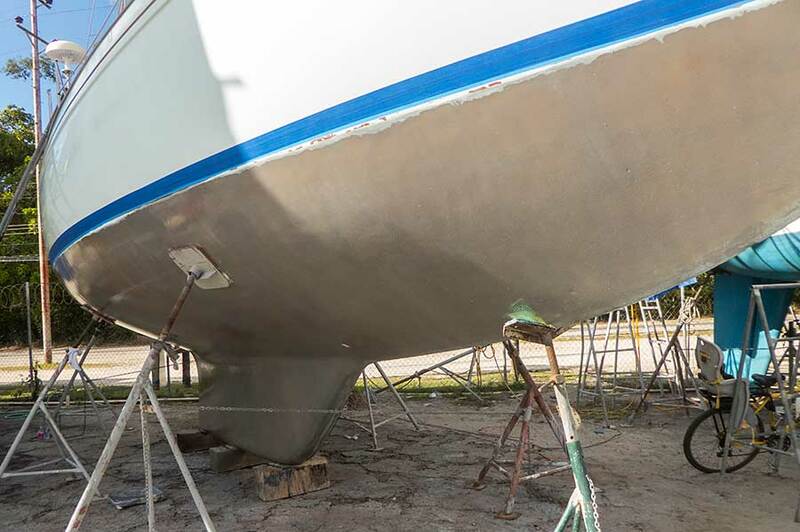 The lesson we have learned is that we should never have had a fibreglass hull grit-blasted. 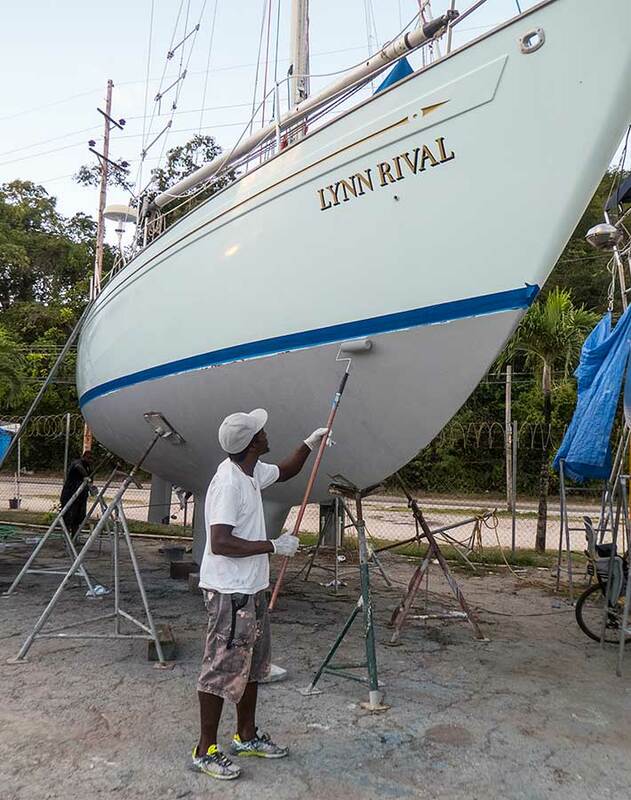 The business we engaged to do the job in 2012 came recommended as a marine specialist but clearly the effect on Lynn Rival's gelcoat was disastrous. However, it's no good crying over spilt milk. Rival's are strong boats and once back to the glass fibre we were relieved - but not surprised - to find it in excellent condition. 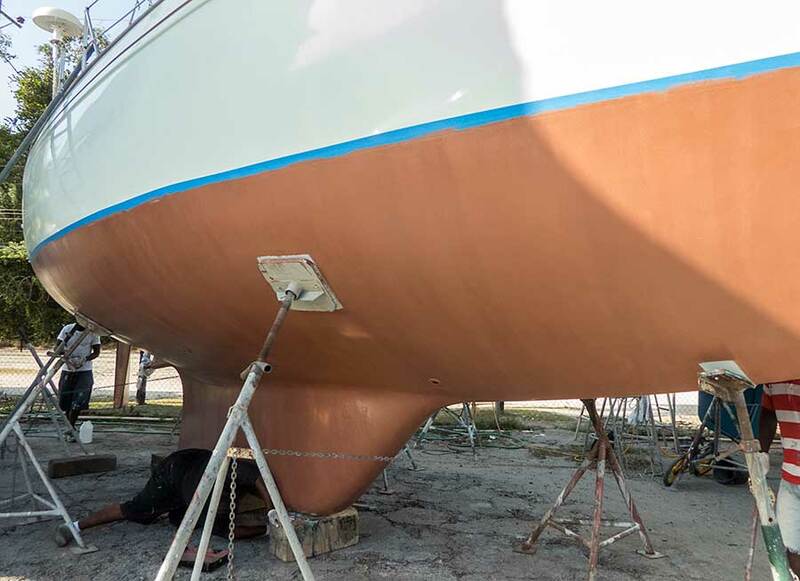 Cow has now covered it over with multiple layers of an epoxy-barrier coating before, once again, applying coppercoat antifouling. Cow applying epoxy primer . . . 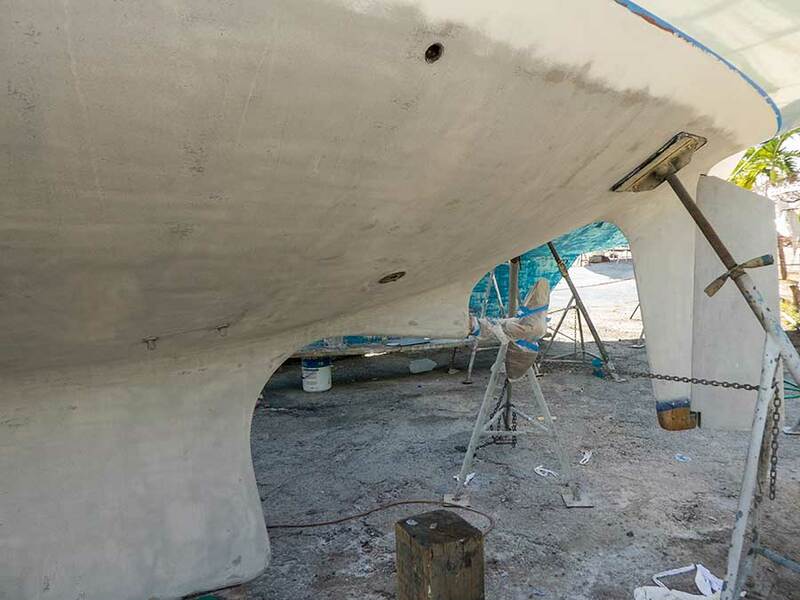 It all takes time, especially finishing off the fiddly bits, under the props and keel blocks but we're beginning to get excited about getting back in the water. In the meantime Paul has been overhauling the seacocks and various time-consuming plumbing tasks as well as making a frame to support larger solar panels that will increase our renewable power generation capacity. Rachel has been varnishing areas that get heavy wear, such as the saloon table (which sometimes doubles up as a workmate! ), and taking advantage of the opportunity to use the sewing machine to make things like a new cover for the outboard motor. Just in case anyone is worried about how hard we are working in the tropical heat, we should admit to a small luxury. One of the nice things about the boatyard we are in is that they have small apartments to rent. Living on board while on the hard and doing maintenance is not our idea of fun. We get up as early as we can and work in the morning cool, leaving all the mess behind, then return to air-conditioned luxury until later in the afternoon. We've also noticed in the last few weeks that the weather is generally more pleasant: less humid and more breezy now that we are in the "dry season" with the trade winds blowing strongly out in the Atlantic. One day we took time out for a "Taste of Trini" organised by Jesse James - a local who is well known for his enterprising efforts to entertain visiting cruisers. 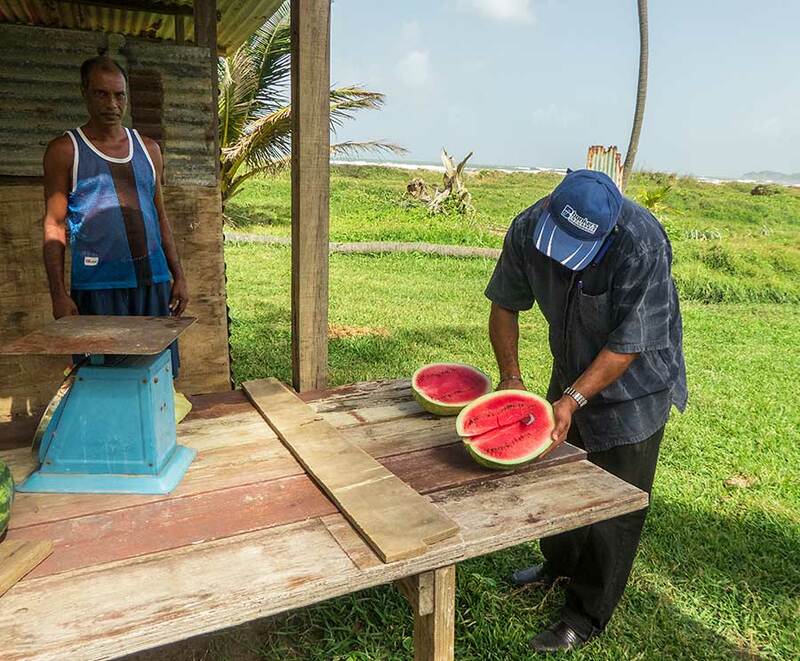 The tour involves driving across the island and back through the countryside, stopping for local food along the way. We ate or drank over 70 different foods and beverages, some familiar - like watermelon - and others extraordinary - like fresh cocoa beans. Jesse is a very good guide, telling us all sorts of interesting things about Trinidad and it's cultural heritage. And, the scenery along the Atlantic coast and through the central highlands is beautiful. 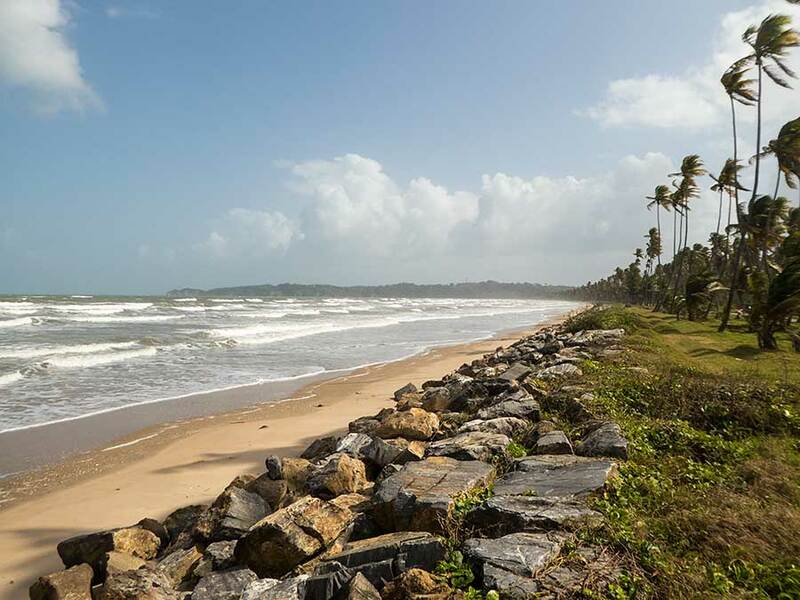 The east coast of Trinidad, exposed to the Atlantic trade winds . . .